Marketing is one thing. Designing intentionally for social engagement is another thing all together. This is a story of a very fun creative process that has resulting in two contests announced this week. Nefesh b’Nefesh (the Israel org that promotes and facilitates aliyah by minimizing the financial, professional, logistical, and social obstacles to doing so) approached us eager to “amplify the conversation about aliyah in the American Jewish community”. While they have helped bring tens of thousands of new immigrants to Israel, discussion of aliyah isn’t really normalized in the American Jewish community. So, what can social media to do help? The key to social media is the social more than the media. The challenge was to create content that wasn’t talking AT people, but talking WITH people. And further content that people in those conversations would want to share with their friends and family, leveraging networks to spread the word. That’s designing for social. First, we identified key target audiences who are ripe for considering aliyah and are also highly engaged in social media. While many who are retiring may consider moving to Israel, they are not the target “highly social online” demographic we sought. The two we landed on: Those getting married and starting to shape a new life together; and those seeking exciting employment in a tough economy. Next, how to get those groups talking about aliyah? We helped Nefesh b’Nefesh design two contents: The Best Job Contest and The Wedding Gift Challenge. In the Best Job Contest winners will be awarded paid jobs with top rate companies based in Israel such as SodaStream, IBM, and The Times of Israel, among others. In the Wedding Gift Challenge, winners will prize money to help start their life in Israel, and/or IKEA shopping sprees and vineyard tours. In the contests, participants are evaluated based on votes on their contest page, and in the Job Contest, also on creating online content (blogs, video, tweets, etc.) about their process of deciding and planning to make aliyah. By incentivizing those considering aliyah to make their thinking and planning transparent, the participants themselves are amplifying the conversation about aliyah in their social networks. Which, we assume, largely also fall into the target demographic we seek to reach. Every organization has a mission, but that doesn’t mean the staff alone are responsible for bringing that mission to life. If your goal is wide communal action, change of perception, or something as bold as amplifying a conversation about aliyah through the American Jewish community, you can’t rely on direct messaging alone, whether that’s by mail, email, Facebook page or otherwise. It’s time to engage your constituents as your ambassadors and evangelists. How are you doing it? Know someone considering aliyah? There’s loot to be won! Check out the Best Wedding Gift and Best Job Contest and spread the word! Over the past six months Matan, founded 12 years ago, launched the inaugural Matan Institutes for Jewish Educators. In March, 18 Education Directors came together for two days of intense learning related to Jewish special education; in August, 40 congregational school teachers spent one day with Matan learning how to make their classrooms accessible to all learners. What we love about special education is that in actuality, it is simply really good education. Special educators pay close attention to the learning styles of each of their students – whether their preferences are visual, oral, tactile or kinesthetic. These teachers plan their lessons making sure there are elements within that will reach every type of student. In the 21st century classroom, technology is a remarkable tool that helps students access information in the ways that work best for them, often bridging the divide between different types of learners. And so, when Matan was accepted into Darim’s Boot Camp for Jewish Educators, we saw a remarkable opportunity to combine the best of what special education and technology have to offer. We made a conscious decision to focus our time with Darim on the educators that we train, with a particular eye towards the launch of The Matan Institutes. In so doing, we have had the unique opportunity to model the use of technology with educators looking to increase their skill set for engaging children with special needs, thereby impacting over 8,000 congregational school students across the country. In “social media speak”, Darim and Matan went viral. Matan modeled various techniques we learned from Darim, and we will continue to do so with future cohorts of educators. Among the most well-received: a thumb-drive for participants containing every presentation, every handout and lists of relevant resources (in addition to printed and screen-projected documents, because every adult also learns differently from one another); the use of Poll Everywhere (never before seen by Matan’s participants and a great way to engage tweens and teens in the classroom); and tweets that highlighted the messages of our nationally-renowned speakers with a much wider online audience. Perhaps most importantly, we have the opportunity to continue working with these educators through webinars (a skillset learned from Darim), thereby making Matan the first Jewish Special Education organization that provides ongoing support and mentoring to the educators we train. Having the ability to move beyond “one off” professional development sessions provides Matan with the opportunity to truly change the landscape of how children with special needs are included in Jewish education. Thank you, Covenant Foundation! Thank you, Darim! Meredith Englander Polsky is the Director of Training and Advocacy at Matan, and, along with Orlee Krass, Matan's Director of Education, participated in the Social Media Boot Camp for Educators, which is generously funded by The Covenant Foundation. Point of clarification: your list is not a network. I sometimes hear organizations talking about the number of people they have involved with their work – their network – and then reference the people who have signed up to receive their email updates. That’s great! It’s wonderful that so many people are interested enough in your work and the difference that you’re making that they signed up to get your communications. That can be really important and powerful. It’s just not (necessarily) a network. 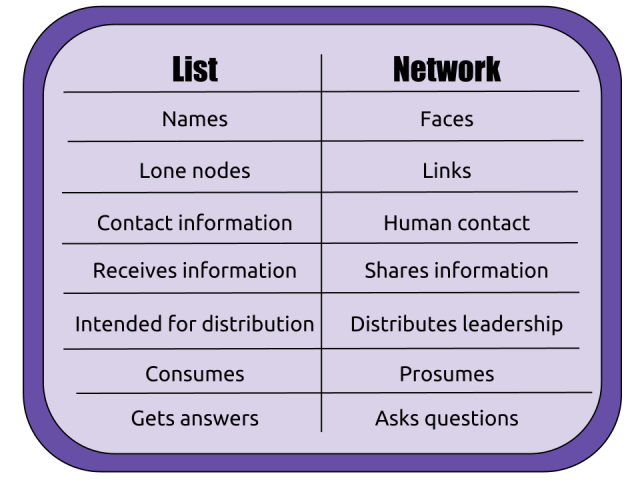 Below is a graphic outlining the qualities that make a list a list, and a network a network. Take a look, and think of it as a checklist. Where are you working with lists, and where with networks? What points could you focus on to make your efforts more networked? Node: A node, or vertex, is any point in a network. It could be a person, place (like a city), or thing (like a computer). Link: A link, or edge, is what connects two nodes. If the nodes are cities, the links may be something tangible like a highway system. If the nodes are people, the links may be more ethereal, like friendship, family, or professional relationships. Prosume: This is a word that comes out of the software development world; it is a combination of “produce” and “consume.” For more on the Jewish prosumer, check out this post. 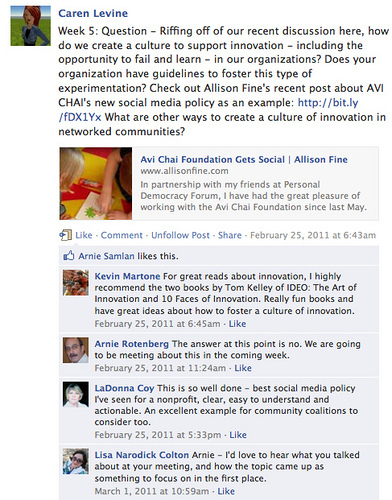 Some organizations jump into social media with great excitement. Others with great trepidation. What we know is that the rules of engagement in social media are in many ways fundamentally different than those of other communication tools we’ve used in the past. A good social media policy provides clear guidelines as to how staff should represent themselves and the organization when posting and interacting with the community, freeing them up to think more strategically. A social media policy is also likely to help leadership feel more comfortable with the less formal nature of social media by letting them establish boundaries for its use. Often to gain comfort and confidence, we need to reduce the fear, get clear on expectations, and be on the same page with our staff, supervisors, board members, and the community. This Workbook is designed to help you, as an organization, ask important questions about social media, and how you will manage it and use it to your advantage, thoughtfully. The Workbook is offered as a PDF download free of charge, thanks to our sponsors, The AVI CHAI Foundation, The Union for Reform Judaism, and See3 Communications. We are stepping through the threshold of a new age. Connected, individually empowered, globalized, diverse and personalized. The technologies of today are far more than digital communication tools – they are transforming society at an increasingly rapid rate, with important implications and opportunities for the Jewish community. Synagogues in particular are in the spotlight in this moment of transformation. When communities are self-organizing, and individuals are seeking “anytime, anywhere” involvement, the structures of synagogue business models, programs and culture are often resonating less and less with those we seek to engage. In partnership with UJA Federation of New York, and inspired by the work of Beth Kanter, Allison Fine, June Holley and many others, Darim Online is launching an initiative to explore what it means for synagogues to function as truly networked nonprofits. We call them Connected Congregations. Connected Congregations focus on strengthening relationships, building community, and supporting self-organizing and organic leadership. They are flatter and more nimble, measure their effectiveness in new and more nuanced ways, allocate their resources differently, and use technology in a seamless and integrated way to support their mission and goals. As we seek to create rich, connected congregations, investing in relationships is the foundation on which everything else is built. Like fabric that’s made up of individual threads woven together, the strength of the community is dependent on the strength and character of both each individual thread (relationships) and the tightness and pattern of their weave. But being a weaver and knitting a healthy and vibrant community takes more than good intentions. It means knocking down ‘fortress walls’ (in the language of The Networked Nonprofit), pivoting our culture, evolving our staffing structure, and remaking our structures of leadership. It takes real change, and active stewardship of that change over several years. There’s a lot of research and work to come for all of us. As we get started, we’re launching a blog carnival on Connected Congregations. Over the next few months we’ll be handing the microphone of this blog to many smart people both from within and outside of the Jewish community, and some who straddle both worlds. We’ll be encouraging them to share their ideas, their work, their insights and observations in order to develop a narrative and invite you into a conversation about being – and becoming – a Connected Congregation. You can follow this series of posts on our blog by searching for #connectedcongs on our site, and following the conversation on Twitter with the hashtag #connectedcongs. Do you have a story or insight to share? Contact Lisa Colton if you’d like to be considered for participation in the blog carnival. It’s Elul and the High Holidays are just around the corner. Now is the perfect time to get your Facebook Page ‘Likeable!’ How will you use it as an entry point for prospective members seeking to engage in the holiday season, and as a point of connection for current members? We’ve compiled 10 ideas to get the conversation going. Feel free to add your ideas and your social media "New Year’s Resolution" for deepening your community’s engagement. 1. Create a series of 5 questions to ask on your page related to Slichot and Elul. It’s always a good idea to ask at least two people in advance to comment on each one to get the converstion going. 2. Recruit 10 community members to hold up a sign that indicates something they are thankful for. Post 2 photos a week over the next five weeks on your Page. 3. Ask fans what is a new beginning for them – you can create an open ended prompt in your post, like "My new beginning for this year is…." Follow up with weekly "new beginnings" updates. 4. Be transparent – show how you are getting ready for the high holidays, including "behind the scenes": photos of staff stuffing envelopes with tickets, setting up chairs, cleaning the kitchen, etc. 5. Share content from Jewels of Elul daily to the page. Hit "share" and ask your own question on top of it. Create a video "playlist" of videos that address High Holiday themes and post them once a week during Elul. 6. Post seasonal recipes and ask people to talk about their own versions of those dishes. Solicit favorite holiday recipes and memories and encourage people to include photos. 7. Welcome new members by name as they join your community and upload their family photo (with their permission). Encourage folks to find these new community members and introduce themselves over the holidays. 8. Play "Jewish Trivia" – develop a list of little known facts and customs about the High Holidays and ask questions in a post…revealing the answer later in the comments. Example: Why do some people wear tennis shoes on Yom Kippur? 9. Create Rosh Hashana, Yom Kippur, Sukkot, and Simchat Torah Timeline cover photos and rotate them out accordingly. 10. Crowdsource part of your High Holiday drash by posing questions to your community and soliciting their responses. What is your community doing to get your Facebook Page ready for the High Holidays, and to capitalize on the increased attention during this time of year? When The Networked Nonprofit first was published I grabbed a copy for myself, my staff, and my major funders, and further recommended it to the leaders of the Jewish organizations with whom I work. As I read the book, I instantly knew that this was meaty stuff that we’d all need to chew on. Facebook had recently revamped its Groups, and it seemed like the perfect place to take the conversation for a spin. Thus began “Darim’s Networked Nonprofit Book Club”. My staff and I invited many people in our networks and our professional communities who we felt were “ripe” for the conversation. Those people added folks from their own networks, and the group quickly swelled to more than 50. We began the Book Club by carefully crafting a couple questions per chapter, and focusing on about one chapter per week. We quoted the book, took inspiration from the questions listed at the end of each chapter, and attempted to lead a traditional book club on Facebook. It was working pretty well as planned. Then members started posting their own questions, and some people just found the book and joined when we were already discussing chapter 5. Actually none of this mattered. In fact, it was great. What began as ‘hub and spokes’ naturally evolved into a network discussion: the Book Club became a rich self-serve space where like-minded people came to learn with and from each other, explore ideas, share knowledge and experience, and challenge one another. We dropped the formal book club structure (Week 2: Question 3 ….”) and started to steward the conversation around Network Nonprofit themes. We developed vocabulary and conceptual understandings together: Core and periphery, social media as a ‘contact sport’, and awareness of what “losing control” really means in a social media landscape, for example. By developing a shared language our Book Club bonded in a way – we could talk with each other about these ideas and visions even if our bosses and colleagues didn’t always get it. Having this peer group was validating and supportive. We rose to the challenge when members of the Book Club posted things they were wrestling with. One person’s “fear of failure” post elicited a robust conversation and sharing of case studies to help us reframe “failure” in this time of experimentation and change. Participants’ willingness to put these kinds of issues on the table furthered everyone’s learning much more than if I had formulated the questions. These posts really helped us focus not only our actions, but also how we are leading culture shift within our organizations. We embraced the fluid, emergent and evolving nature of the conversation. While we are still actively discussing the themes in The Networked Nonprofit, we are also using our Book Club to explore related works and ideas. I recently wrote a book review on our blog and a member of the Book Club commented, “we should do a Book Club for this one too!” So we introduced the book and have begun a lively (and fairly focused) discussion. Many new people joined the Facebook Group as they learned about the opportunity, and thus the size, scope, topics and energy have evolved over time, and I suspect will continue to do so. I am constantly inviting people to the Book Club to continue their learning after a webinar or live workshop, to ask questions of the group to support their own professional development and practice, and to find their peers in this work. We’ve all found that this “anytime, anywhere” professional development is incredibly valuable, accessible and fun for the 200 members of the Book Club. It’s amazing simple (and cheap) for us to run, and a great way to build a professional network. How do you take advantage of “anytime, anywhere” professional development? We will watch you for a long, long time, as you cross to the other side. We will be more wise than Pharaoh: we will know that where you go we cannot follow. Being an education director in a progressive synagogue is not unlike being a parent. We give children and families a strong foundation and the tools we think they’ll need, and trust that they will build lives we cannot even imagine but anchored by enduring values. This analogy proved to be true with our social media project this year: we recognized a need, provided support and tools, and watched as our families took ownership and adapted the program over the course of the year. The Jewish Reconstructionist Congregation proposal to Darim was to create a chavurah of religious school families who would gather monthly to experience a variety of aspects of Shabbat, from a Friday evening Kabbalat Shabbat to a Saturday evening havdalah service. A social media component would enhance the monthly in-person gatherings by allowing for ongoing conversation and idea-sharing between Shabbatot. This idea originated out of a year-long school study group in which we identified the need to educate parents in Judaism – in particular, Reconstructionist Judaism – and to nurture relationships between families so parents would model for their children their own engagement in the community. It came as a surprise to us that few turned to social media to enrich or supplement their personal connections with each other. Rather, chavurah families invited one another to shabbat dinners and gathered in the lobby during religious school classes and choir rehearsals. People seemed more ready to make time to be with each other than to connect via technology. We learned that people read the announcements on the Facebook page but rarely commented or posted. This even applied to members who update their own Facebook page regularly and frequently. Facebook is being used to post dates for upcoming events, coordinating such things as meals or children’s activities, and to send out reminders. After each event there are one or two parents who post a sort of shout-out to the group, usually to say thank-you. Our project leadership team was not successful in our attempts to remind participants that the congregation was looking to them as a test group to explore social media applications within the congregation. I do want to say, though, that Ellen Dietrick, our Darim coach, was a great resource to us, with a knowledgeable grasp of our concept and terrific suggestions. Chavurah participants quickly developed ownership of the group and new leadership arose. The chavurah took control of programming content and scheduling. Beyond the original scope of our proposal, a majority of chavurah families attended JRC’s Memorial Day weekend kallah, and continue to meet to plan future events and outreach. We were disappointed that we failed to actualize our vision of chavurah blogs, online discussions and links to relevant articles. However, although the method was not what we envisioned, we were successful in our goal of creating a tightly-knit, committed community of school families that is more Jewishly knowledgeable and has the motivation and the tools to function independent of the school. Based on what we observed in the chavurah and what the participants reported, JRC is going to launch a Meetup.com account so congregants can post suggestions for getting together at venues outside the synagogue. Meetup.com offers enough flexibility as to be useful to all demographics. Someone might suggest an activity that is size-limited or age-limited, such as a block of tickets to a children’s theatre; or it can be open-ended, such as a general invitation to any JRC members who want to congregate at a free concert in the park. We do not know yet if Meetup.com is the right platform, but we are optimistic that we are on the right track, balancing leadership and responsiveness. Terri Ginsberg Bernsohn has been Director of JRC’s Religious School since June 2003, and a member of JRC since 1992. This post is part of our special summer series highlighting stories shared by our 2011-12 Social Media Boot Camp for Educators Cohort. The SMBC for Educators is made possible through a generous grant from the Covenant Foundation.